This simple pasta recipe requires minimal effort but gives maximum flavour. All you need is four ingredients: pasta, tomato sauce and cheese and the pièce de résistance, red chiles. 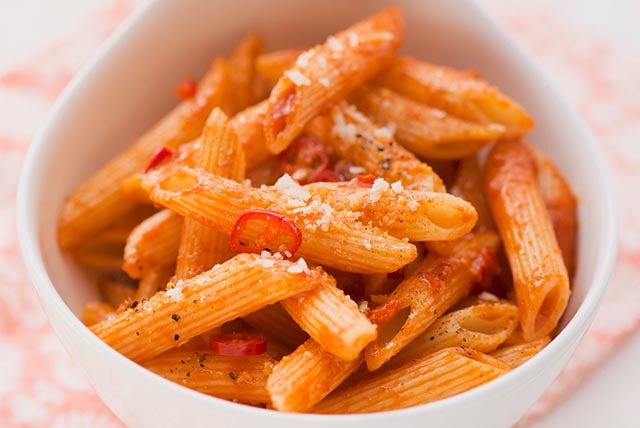 Spice things up a little and try this Penne all’Arrabbiata recipe tonight! Meanwhile, heat sauce in saucepan on medium-low heat. Drain pasta and add to sauce. Serve immediately; top with chiles and cheese. Substitute your favourite hot pepper for the Thai red chile. Wash hands well after handling chiles.